These cookies are perfectly chocolaty and oh so good. 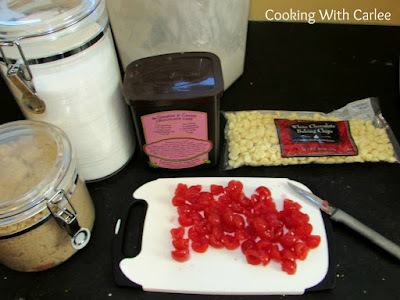 They are dotted with cherries and white chocolate chips to give the feel of that favorite candy. The fudge frosting makes them soooo good! I just love Christmas cookies! I love making them and I love eating them. 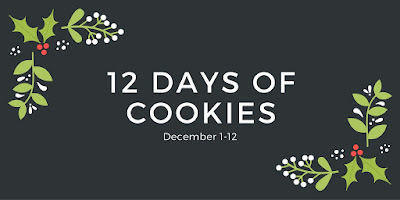 There are certain cookies we have to have every year. Of course you need sugar cookies. Then there are the fudge dipped crescents. We have to have the chocolate dipped Ritz crackers and peanut butter, chocolate covered pretzels and buckeyes just to name a few. We only make most of them at this time of the year, so it is something to look forward to. As much as I love the traditional cookies, I also love to try new things. When I saw this recipe for White Chocolate Maraschino Cookies at Tabler Party of Two, I was inspired. Pops loves chocolate covered cherries, so I couldn't wait to put my spin on it and make it a chocolate covered cherry cookie. Matt ate half the batch himself and some went on cookie trays, so Pops only ended up getting a few. Poor Pops! I'll just have to make more! In a bowl, mix together the flour, cocoa, baking soda, baking powder and salt. Place mounded tablespoon sized balls of dough on parchment lined baking sheets and place in freezer for 30 minutes to an hour. Take cookie sheets from the freezer and bake for 10-12 minutes or until the centers are set. Cool for 5-10 minutes on the baking sheet then remove to a wire rack. For the fudge, melt chocolate chips, butter and milk in a double boiler. Whisk in the powdered sugar until smooth. Spread over cookies and let sit out until the fudge is set. Then you can stack them and store in an airtight container. 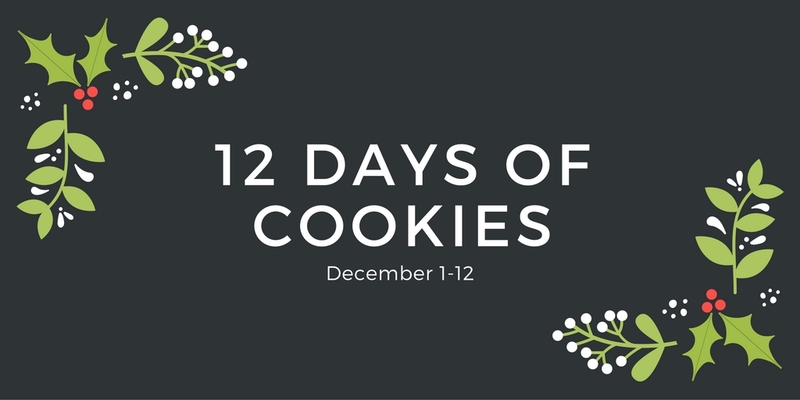 Check out my Pinterest board for more great cookie ideas! I love chocolate covered cherries and cookies. This was a very creative idea! Thanks for sharing! Thank you! Once I had the idea I couldn't get it out of my mind! Thank you for sharing, my husband is going to love this recipe! And thank you for linking up to the Holidays Celebration Link Party! I hope he does love them! Mine ate a bunch of them, which is really strange for him. My poor dad who inspired them only got 3! Thanks for hosting. 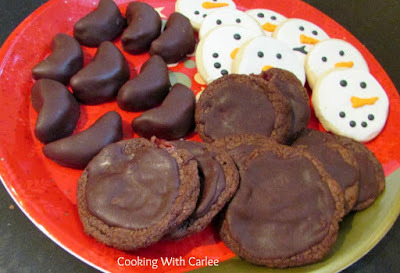 These cookies sound so good Carlee! I love chocolate covered cherries and these cookies look so yum! Thanks for sharing your recipe at the Over the Moon Link Party. I hope you give them and try and love them! Thanks for hosting, Sandy! What a neat sounding recipe! Thank you, it was fun to see it come to life after imagining it! I love cherry anything! and combine it with chocolate, mmm! Thanks for joining us on the Tasty Tuesdays Linky Party. I hope you will join us again in two weeks (on Dec 29th). Me too! Thanks for hosting, have a merry Christmas! I love cherries and chocolate together. I'm supposed to be baking cookies right now but, of course I'm on the iternet! Thanks for joining us at #SaucySautrdays, Carlee! Me too! This weekend and last weekend have been so busy baking that I feel behind on Monday because I haven't been online as much as normal! Then I feel bad because it takes me all week to catch up on by bloglovin' feed! Thanks for hosting! My son loves any and all things cherry! Can't wait to surprise him with these cookies. Pops loved them and won't complain if you feel compelled to make more! ha!! I'll take that into consideration! 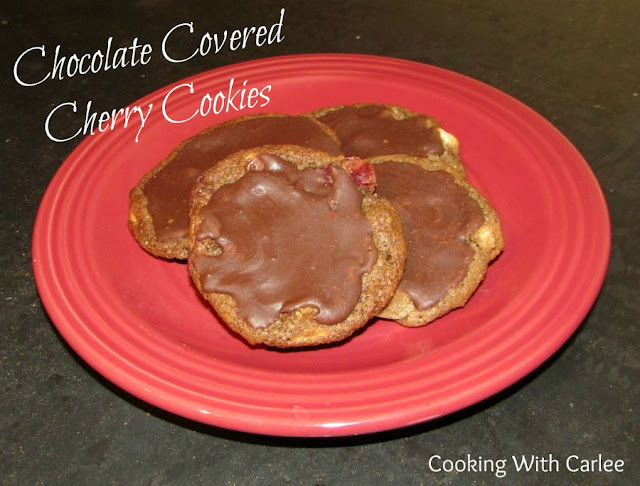 These look delightful.... You know I love the cherry chocolate combo! 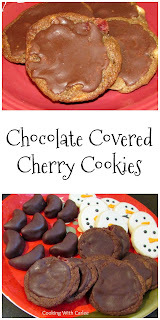 Oooooohhhhh, chocolate covered cherries....in cookie form.....I think I'm in heaven. One of my favorite combos.